Can we be honest with each other for just a moment? Now, we’re all kind, peaceful people who wish harm on no one and regularly snuggle adorable kittens, but there is something horrifically awe-inspiring about the tools man has created to destroy his fellow man. Whether it be sunlight glinting off the razor edge of a Japanese katana or the apocalyptic fireball of a nuclear bomb rising tens of thousands of feet into the air, weaponry appeals to a very primal part of the human brain, one originally dedicated to the predator/prey struggle and the idea that if you didn’t get the other guy, he was gonna get you first. To narrow the scope a bit, today we’re going to discuss the enduring appeal of the sniper. Ever since humanity developed weaponry that could kill from afar we have sought to increase that distance, and the modern sniper is akin to a living scalpel in his or her ability to surgically disable key enemy units from hundreds of yards away. 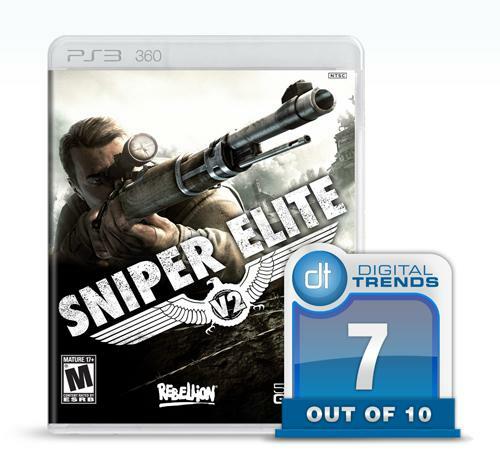 Frankly, that’s cool, and as a result, it is the cornerstone of Rebellion’s new shooter Sniper Elite V2. More on the inherent appeal of long-range death dealing in just a moment, but first, let’s discuss the game’s various plot and technical bullet points. Oh, you better believe that pun was intentional. Sniper Elite V2 is the latest entry in Rebellion’s Sniper Elite series. 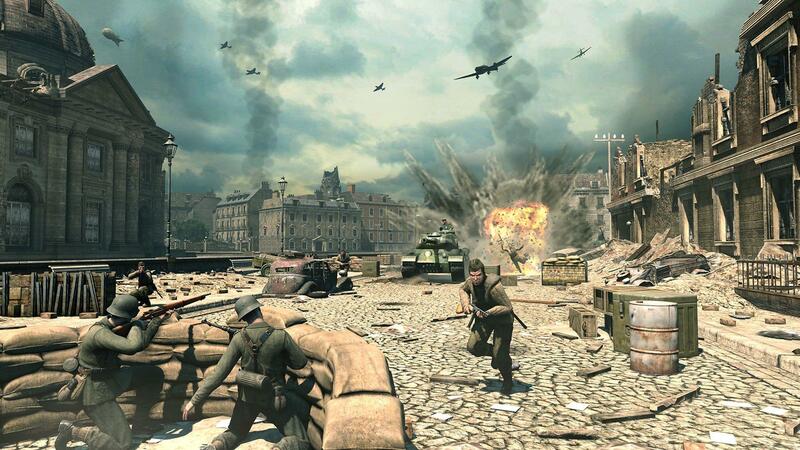 It is preceded by 2005’s Sniper Elite: Berlin 1945, and is described as something of a remake. Thus, that “V2” at the end is a play on words. Yes, this is “version 2” of the original Sniper Elite, but it’s also a reference to the title’s plot, in which you play an OSS officer dropped into Berlin toward the end of World War II, in an effort to disable the Nazis’ ability to launch the massively destructive (if arguably flawed) V-2 rockets. This being a video game, the best way to accomplish that is by killing every German involved with the rocket’s development. And while there are other, minor plot details in play, the above is more than enough to set you on your way. Once in the actual game, you’ll notice that while Sniper Elite V2 is a shooter, it’s not your typical run n’ gun affair. Actually, if you attempt to employ standard shooter tactics, you’ll be shot to pieces in rather short order. Instead, you’re asked to proceed methodically, slowly, and utilize every possible advantage you can find to take out your targets. In the end this usually entails pushing a bullet through a person’s brain pan, but on the way to each mission’s conclusion you’ll find yourself laying mines, booby-trapping doorways, and sneaking through rubble in an effort to avoid Nazi patrols. It’s not quite Metal Gear Solid, but then again, that’s not what Rebellion was going for here. Instead, the developer aimed to create the perfect blend of realism and action movie flair in the tale of a sniper battling through the heart of Nazi Germany as the country falls apart toward the end of World War II. Sniping is the key here, and in that regard, Sniper Elite V2 is brilliant. Rebellion has crafted a ballistics model that takes into account real-world factors like wind, bullet-drop and leading one’s targets (which can be turned on and off depending on player preference and skill), along with slightly fictionalized representations of what a sniper goes through to squeeze off that crucial shot. For instance, it’s common for a trained sniper to slow his or her breathing before squeezing off a round, lest an unexpected inhalation accidentally move the crosshair a few millimeters off target. In game, this is accomplished by tapping a shoulder button that slows down time and superimposes a red diamond over the area where your bullet will impact. It’s not exactly realistic, but this is still a video game and to be honest, it works. Oh, but I haven’t mentioned the best part: When you’ve finally lined up your shot and pulled the trigger, assuming your aim is accurate, the game shifts into a slow-motion vignette that is just intensely cool. Allow me to paint a scene for you. There you are, lying prone in the rubble of a bombed out building, in a sleepy European city that was recently gutted by the Nazi war machine. The streets are full of low-level German grunts, the nearby buildings are full of likewise prone enemy snipers, and your only comfort is that you’ve still got a round left in your Springfield M1903 rifle. You notice a bright gleam coming from the window sill of a nearby building. It’s about 100 yards away, but through the scope of your gun you can just make out the head of an enemy soldier. He’s scanning the area but somehow missed your vantage point, and that’s all the opportunity you need. You calm your tense nerves, draw in a deep breath, hold it, and pull the trigger. That last round explodes from the end of your rifle, faster than the speed of sound, yet the game’s camera tracks it all the way to the target. It spins around the bullet, stops just behind it, then right at the moment of impact, cuts to a side view of your foe who, for the sake of maximum dramatic impact, has been rendered as an anatomical cutaway. You can clearly see his skeleton, his lungs, his heart, and then a split-second later, your bullet shatters his jaw, drives itself through the back of his skull and bursts through his helmet to lodge itself in a nearby wall. I realize the above sounds like poetic license, but it is an absolutely spot-on retelling of an incident I experienced in Sniper Elite V2. Following that shot, I had to pause the game and laugh out loud at how badly I had mutilated that poor virtual soldier. Have you ever seen a guy’s jaw torn off by the force of a bullet? I wouldn’t recommend running a Google Image Search, but in this game it’s simultaneously horrifyingly macabre and intensely satisfying. Truth be told, the depth and theatricality of the sniping in this title is a gimmick, but it’s a very, very well-crafted, engrossing gimmick. If Rebellion had to choose one aspect of a shooter to flesh out to ludicrous extremes, I’m glad they chose this one. Likewise, it lends itself to quite a bit of replayability. Every successful shot is awarded points based on distance and where you hit your target, so there is a very definite appeal to replaying the game’s relatively short amount of content in an effort to accrue an even higher score. Rebellion also included a handful of arcade-style missions where enemies will rush at you in waves and you’re tasked with using your wits and skill to survive as long as possible. As it stands, this section of the title is a bit meager, but the promise of upcoming downloadable add-on missions should be quite exciting to anyone who has finished the game’s main storyline. It bears mentioning though, that in putting so much effort into the game’s sniping sections, Rebellion seemingly neglected some of its more basic aspects. Though the levels are well-designed, the overall aesthetics almost look dated. They certainly don’t compare to the latest Call of Duty or Battlefield titles. Additionally, the enemy AI can be spotty at times. While the loud report of your shots will frequently summon hordes of soldiers who will attempt to seek out your position, take cover, and return fire, I also encountered a few soldiers who refused to react, even after I’d shot them multiple times in some rather sensitive areas (as it turns out, the game’s sniping mechanics lend themselves quite well to forcibly removing a Nazi’s ability to procreate — and yes, I’m slightly ashamed of how much that amuses me). Also hobbled by Rebellion’s focus are the game’s movement controls. Though sniping is in first-person, the rest of the game is a third-person affair, where you spend most of your time crouch-walking to avoid detection. Unfortunately, you’ll find that the game is not always consistent in what it will allow you to walk on. For instance, there was one particular building whose floors were piled high with rubble. To the side there was a row of windows, most of which could be jumped out of, yet there were two that could not be used in any way, despite the fact that they were wide open and seemed just as viable as any of the other windows. I would say it was a weird quirk of the few inches of space between the window and the rubble next to it, but the game insisted that I use windows that were far less accessible. Overall this is a relatively minor issue, and you won’t notice quirks like this all that often, but it does indicate that the game could have benefited from a bit more polish. Despite this, I can’t help but enjoy Sniper Elite V2. It does one thing really, really well, and no other game on the market can rival this thing’s sniping action. That said, I can’t recommend it to everyone. The reality is that Sniper Elite V2 is, as far as shooters go, a very niche title. Not everyone wants to sneak around and spend relatively peaceful moments setting up the perfect shot, but for those who do, the experience, though flawed, is totally worth the game’s relatively inexpensive $50 price tag. It’s far from perfect, and is certainly not the best looking shooter on the block, but if you enjoy dropping enemy soldiers from far, far away, you really ought to give Sniper Elite V2 a shot. If your primal, lizard brain isn’t tickled by watching a bullet rip through an enemy’s lungs, then obviously this isn’t for you. But for a large segment of action game fans, it’s an engaging panacea for the various stresses of reality.